Bart and Milhouse have grown up as troublemakers in the streets of Neo-Springfield, but the nature of their relationship changes radically when Bart starts manifesting powerful psychic abilities. Artist Ryan Humphrey found a strange and visually compelling mashup with his Bartkira images, and it's turning into a project to reimagine Ōtomo Katsuhiro's entire manga classic. 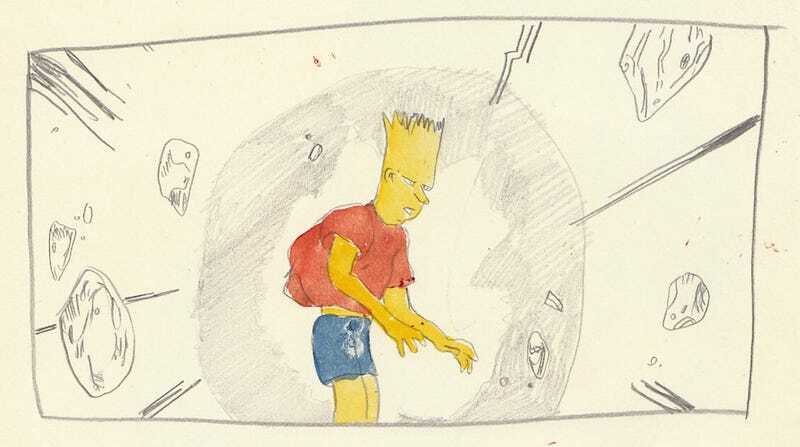 After Humphrey posted a handful of images casting Bart Simpson as Tetsuo, Milhouse as Kaneda, and Lisa as Kei (I imagine Milhouse and Bart's roles would have been reversed but for Lisa), fellow cartoonist James Harvey proposed the Bartkira Project, soliciting artists to redraw pages of Akira starring characters from The Simpsons. If you're interested in contributing pages to the project, shoot Harvey an email and he'll assign you a character list and five pages to draw. He figures if he gets enough participants, they can cover the first volume, if not the entire series. You can also purchase images from Humphrey's Bartkira from his Society6 store.